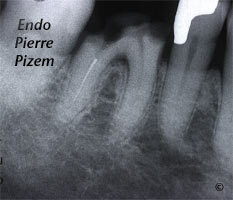 Insertion of a rotating SX file into calcified canal led to instrument breakage because its brittle tip fitted too snuggly into the narrow funnel. 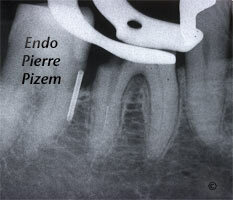 Referring dentist wanted us to retrieve that broken instrument in distal root canal. 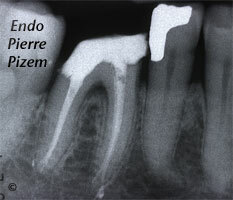 The use of ultrasonic tips could not dislodge the entire fragment after first attempt because apical fragment was too firmly engaged into calcified dentine. Instead ultrasonic vibrations caused it to break once more, leaving a piece of the instrument much deeper into the canal. Thus, we had to work our way around the remaining fragment taking great care not to excessively flare up the coronal part of root canal in order to retrieve the remaining half. Buck 1A and Titanium CPR 8 FROM SPARTAN were most helpful for that purpose. 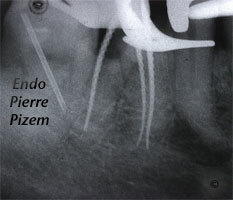 Being able to magnify the “head” of the separated instrument in distal root canal was of a big help in that retrieval procedure.